Discussion in 'Price Drops, Must-Have Freebies, and Deals' started by ritter, Oct 17, 2015. Alien Tribe 2 is now on sale for $1.99! This is 60% less than the regular price ($4.99). It has 4.5 stars reviews and works on iOS 9. If you like real-time strategy go and grab it! Alien Tribe 2 is an 4X strategy space game that combines several genres. Imagine a universe sandbox meets real-time strategy and a pinch of tower defence. With realtime gameplay, objective-based unlocks, and tower-defense flavored combat, Alien Tribe 2 brings something new to strategy gaming. Top 10 in the category Games / Strategy in more than 35 countries Top 10 in the category Games / Simulation in more than 30 countries Top 50 in the category Games / Overall in more than 25 countries - Best of 2013 (Sci-Fi / Strategy Games) at iPlayApps.de - Wargamer.com: "Alien Tribe 2 is a great title for any sort of wargamer that enjoys 4X games. Get ready for an intense battle!" 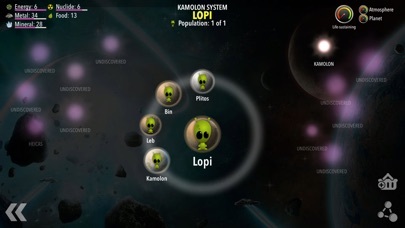 - Apppicker.com: "Alien Tribe 2 ... gives you a space battle like no other. 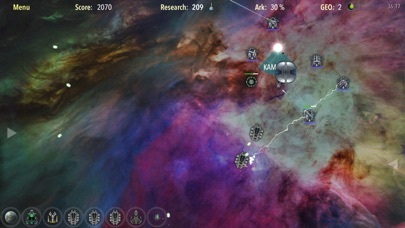 Get ready to be challenged from start to finish in this game" - AppScout: "Alien Tribe 2 for iPad Does Justice to the 4x RTS Genre" - Listed as one of the 10 Best iOS Real-Time Strategy Games at Hubpages - MobileTechReview: "Alien Tribe 2 is a fantastic and original take on the 4X genre" Explore the galaxy and and find solar systems. 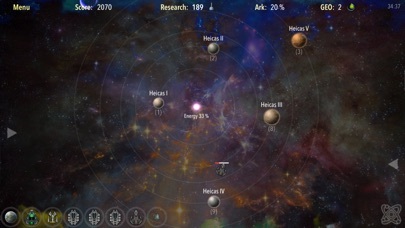 Populate the numerous planets and extract different raw materials. Build weapons platforms for defence and research centres to improve your skills. 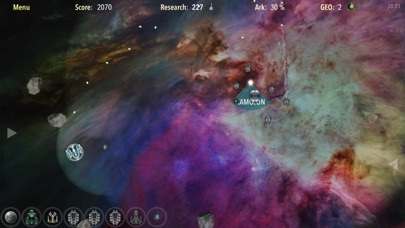 Friends of space strategy games will feel at home here, because colonization and research are core elements of the game. When the raw materials of the discovered planets are not sufficient anymore, scan the space for asteroids and extract additional raw materials there. 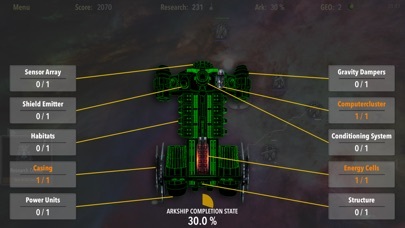 The 4X approach of "eXplore", "eXpand", "eXploit" and "eXterminate" is supported by over 45 missions / quests of the areas of "Military", "Economy", "Exploration" & "Expansion". 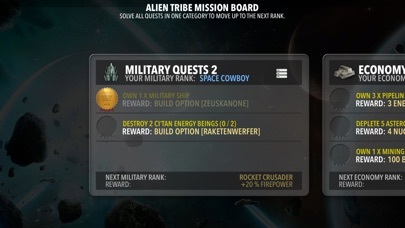 This means that the player is constantly faced with new challenges and once a player successfully completes a mission / quest, he is then rewarded with new build options, research points, the in-game currency called GEO or other various items. 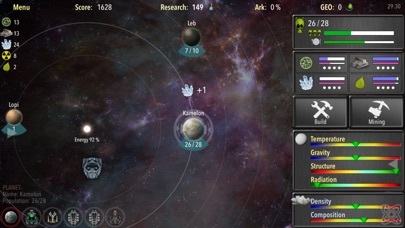 Features: - Find new new solar systems and start to colonize planets - Explore planets and build different kind of stations and ships - Extract the raw materials and build supply chains to your stations - Build weapon platforms and war ships to defend yourself - Scan the deep space for asteroids and start mining them - Increase your skills in the research center - Randomly generated game environment - Over 45 different missions - Search for the missing ark ship parts - Collect the internal GEO currency to buy extras or trade it for resources - In-game tutorial - And much more... The Story: The Fifo, a people of space nomads, had to make a stop in the normal space unintentionally. As they were leaving the meta space, a very destructive asteroid storm destroyed their ark ship. The meager remains of the formerly proud nomadic people was forced to settle on the planet Kamolon. The Fifo want nothing more than to get back to their old life and return to the peace of the meta-space. But they need to find all the parts for a new ark ship. Can you help the Fifo people to find the parts of the ark ship? Only then they can return to their eternal journey through the meta-space.